Arizona Gov. Jan Brewer points at President Barack Obama after he arrived at the Phoenix-Mesa Gateway Airport, Wednesday. Brewer greeted Obama and what she got was a book critique. Arizona Gov. 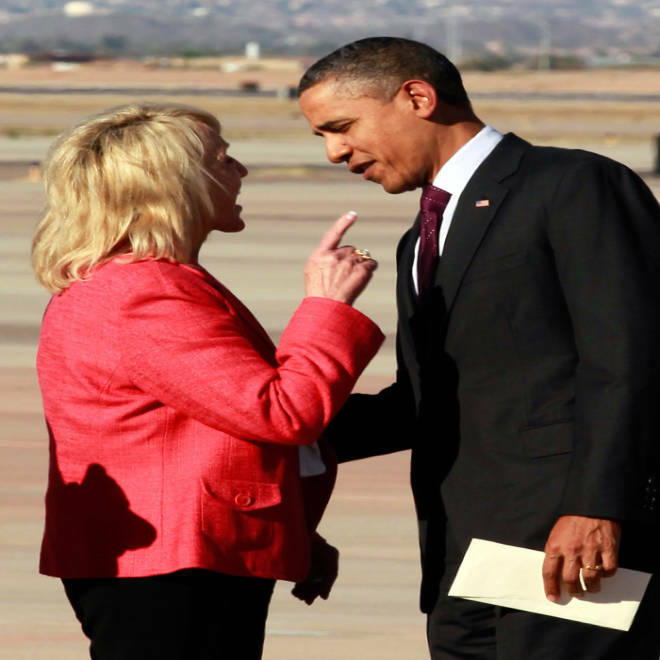 Jan Brewer and President Barack Obama engaged in an apparently tense exchange on an airport tarmac shortly after Air Force One touched down outside Phoenix on Wednesday. The two leaders could be seen talking intently at the base of Air Force One's steps. Both could be seen smiling, but speaking at the same time. Obama appeared to walk away from the Republican governor while they were still talking, according to a White House pool reporter. Brewer confirmed that by saying she didn't finish her sentence. Asked moments later what the conversation was about, Brewer said: "He was a little disturbed about my book." On a Phoenix radio talk show after their meeting, Brewer said Obama was "tense." Brewer recently published a book, "Scorpions for Breakfast," something of a memoir of her years growing up. The book also defends her signing of Arizona's controversial law cracking down on illegal immigrants, which Obama opposes. Obama was objecting to Brewer's description of a meeting he and Brewer had at the White House, where she described Obama as lecturing her. In an interview in November Brewer described two tense meetings. The first took place before his commencement address at Arizona State University. "He did blow me off at ASU," she said in the television interview in November. She also described meeting the president at the White House in 2010 to talk about immigration. "I felt a little bit like I was being lectured to, and I was a little kid in a classroom, if you will, and he was this wise professor and I was this little kid, and this little kid knows what the problem is and I felt minimized to say the least." President Obama and Arizona Governor Jan Brewer faced off in an apparently testy exchange on at an airport outside Phoenix. NBC's Peter Alexander reports. In a statement after the meeting, Brewer didn't mention the airport conversation, and would only say that she discussed economic issues with Obama in a brief meeting. "Don't be mistaken, I'm bullish on our nation's future," Brewer said in a statement issued later. "But I'm convinced the path the president has pursued is the wrong one. I hope he takes some of the lessons of Arizona back with him to Washington." On the tarmac Wednesday, Brewer handed Obama an envelope with a handwritten invitation to return to Arizona to meet her for lunch and to join her for a visit to the border. "I said to him, you know, I have always respected the office of the president and that the book is what the book is," she told reporters Wednesday. She said Obama complained that she described him as not treating her cordially. "I felt a little bit threatened, if you will, and the attitutude that he had because I was there to welcome him," Brewer told reporters following the exchange. A White House official said Brewer handed Obama a letter and said she was inviting him to meet with her. The official said Obama told her he would be glad to meet with her again. The official said Obama told her that in her book, she inaccurately described their last meeting, which the official described as a cordial discussion in the Oval Office. The official spoke on condition of anonymity to describe a private conversation between the president and the governor. NBC News, The Associated Press and msnbc.com staff contributed to this report.